On Sunday Nick was working, so Rosalie and I went to visit her Grandma and Great Grandma. On Monday, My mum and I went to Aldi as the baby and toddler event was on. I bought rather a lot. You can view all my purchases by watching my Aldi Haul Video. On Tuesday, we spent the morning at home. Rosalie played whilst I cleaned. In the afternoon I took Rosalie to be weighed. She weighed 17lbs 5oz. On Wednesday, my friend Emma came over with her daughter Ivy for a play date. Ivy was a little darling and loved to help me take care of Rosalie. She kept wanting to give Rosalie cuddles and kisses. She was so gentle with her. It was very sweet. On Thursday I vlogged. You can see what we got up to by watching our day in the life video..
On Friday Nick was home so we went to visit Nick’s Nan. It was lovely to see her. She had dug out all Nick’s old toys, they were over 20 years old and some of them may have been Nick’s Mum’s! Rosalie loved them. Nanny Pat even had some cream eggs for us too! On Saturday I started feeding Rosalie 3 meals a day. She ate all 3 the first day but then began to go off her food. I think she came down with something. Rosalie really wasn’t herself so I think she was a little under the weather. She wasn’t breast feeding as much either. So I went back to giving her only two meals a day and trying to breast feed as much as I could so I knew she was getting the nutrients she needed. She is back to normal now so I might try reintroducing the third meal again this week. 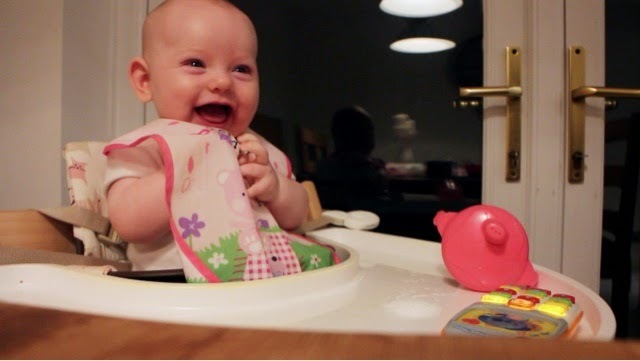 I have also started to give Rosalie two different types of food at each meal time. I try to give her a savoury puree followed by something sweet so its like she has dinner and dessert. I am giving her one portion of each now instead of two portions of one type of puree. This seems to be working better, by mixing it up she doesn’t get bored of the same thing. Rosalie tends to prefer the fruit so always gobbles that up whereas getting her to eat sweet potato and kale could sometimes be hard work. You can view Rosalie’s 24th week of life video here.